The holidays are here, so if your Uncle Bob asked you next week at a family gathering what the real estate market is doing, what would you say? Or if a neighbor heard the market has been slow, how would you respond? Below I have 10 quick talking points to help you impress your Uncle Bob or anyone else with your knowledge of the local market. So let’s unpack some real estate trends in Placer County and the Sacramento region to hone in on two important questions: What are values doing? And why are they doing it? 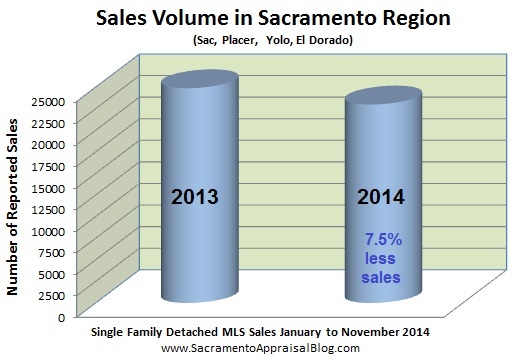 It’s not surprising to see the median price dipped last month by about 2.5% in Placer County. The median price had been at $375,000, and now it’s at $365,000. It is very normal for prices to soften at this time of year, which is seen in the graph below. Yet at the same time, the market really is getting much softer in light of increasing inventory, which is also important to watch. 2) Inventory increased to 3.24 months last month. Housing inventory saw an increase from 2.75 months to 3.24 months from October to November 2014. This increase sounds dramatic, but fewer sales last month played a big role in seeing inventory increase. Remember, housing supply is calculated by dividing the number of current listings by the number of sales over the past 30 days, so a lower amount of sales will naturally drive inventory up. As you can see, inventory is not the same at ever price level, is it? It took one more day this month to sell a house compared to the previous month, and about 10 more days compared to mid-Summer. It’s still taking much less time to sell a house than it used to about 5 years ago, but it is still very important to price listings correctly. When prices are softening and houses are taking longer to sell, this means overpriced homes are simply going to sit. Generally speaking, the higher the price, the longer the marketing time. Keep in mind sales above $1M took only 91 days, but there were only 12 sales, so take that stat with a grain of salt. Realize too that current actives above $1M have been on the market for 198 cumulative days. There were only 345 sales in Placer County this past month, and that’s a fairly low number, though last year in November the figure was only 365. The regional market was extremely flat for about six months, but it finally dipped over the past couple of months in light of the onset of Fall. An increase of inventory is definitely putting pressure on values too. Housing supply lately has been hovering about where it was when prices hit bottom in January 2012. When watching real estate, it’s important to take a broad look at how values are unfolding in surrounding counties as well as the entire region. If we look too closely at any given county, we might not be able to see the bigger picture. By the way, the median price in Placer County is $100,000 higher than Sacramento County. Does this mean prices are $100,000 higher in Placer County? Nope. Keep in mind the average size of house that sold last month in Placer County was about 450 sq ft larger in size than in Sacramento County. This makes for huge price differences, don’t you think? Sales volume is down in 2014 by about 7.5% when compared to the same time period in 2013. This might seem like a trivial number, but it equals about 1900 less sales on MLS so far this year. Our regional market was heavily driven by cash investors over the past couple of years, but cash is no longer king. In fact, there have been 34% less cash sales in 2014 compared to 2013, which effectively means there have been 2186 less cash sales so far this year. This is a huge reason why housing inventory has increased this year because there are simply less buyers in the market right now. As time goes on, non-cash sales continue to show an increase as owner-occupant buyers are ultimately beginning to drive the market more and more. Some good news in the market is that FHA, conventional, and VA buyers have been increasing in numbers. It took one more day last month to sell a house compared to the previous month (10 more days since July 2014). It’s important to be in tune with the trends of each price range too since the market is not the same at each segment. The higher the price, the more inventory there is (generally speaking). As you can see, housing inventory in the region is definitely increasing, and that has dramatically slowed values over the past couple of years. Remember that housing inventory was artificially low at times in 2012 and 2013 because of the massive influx of cash investors who came from outside of the market to take advantage of the lower prices at the time. Since the current market is no longer driven by cash investors, real estate is more prone to be strongly influenced by the health and strength of the local job market as well as increases in inventory. I hope this was helpful, and I do hope you can share something here in a conversation soon. Thank you so much for being here.